How one Oakland cannabis brand sees opportunity in the industry's many challenges. 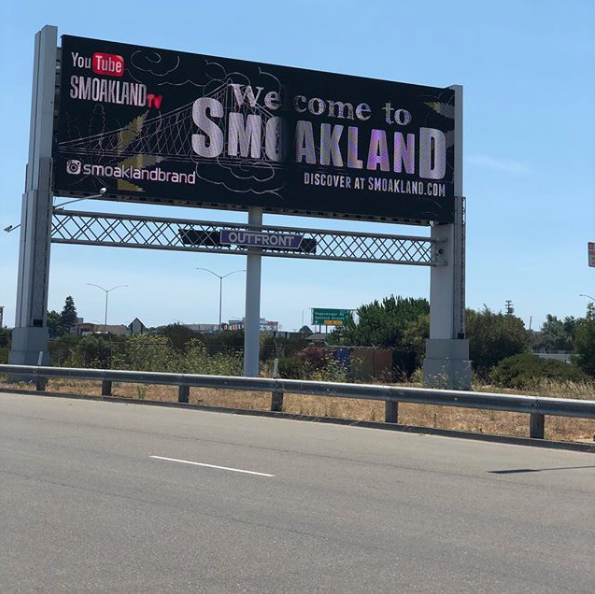 If you've driven on the freeway around Oakland lately, you've likely noticed giant billboards for a company called Smoakland. There's one near the Oakland Coliseum, emblazoned with the headline "Welcome to Smoakland," a double-sided billboard on the 24/980 interchange, and a digital billboard by the Bay Bridge. The signs advertise a YouTube channel, an Instagram account, and a website, Smoakland.com. But its webpage offers only a vague introduction to "a new cannabis experience coming Fall 2018." According to company representative Chang Yi, the company consists of a media outlet, a creative agency, informational workshops, and special events, and is in the process of trying to get licensed to sell hemp-derived CBD products and launch a cannabis delivery service. "Smoakland Media LLC is the media company that is advertising right now on the billboards," Yi said, "so we're putting forward the name and the brand before we get our recreational sales, distribution, and manufacturing licenses." Smoakland's approach is based on the fact that it takes time to not only obtain licensing but also to build consumer loyalty, and trying to do that at a moment when cannabis advertising is restricted or flat-out banned has forced Smoakland to use classic marketing techniques. "We're relegated to billboards, we're relegated to high-traffic events, influential events, sponsorships of personalities, and public personas," said Yi, an attorney who oversees compliance, licensing, and permitting for the company. "We're treating this like the consumer product market that it is for the recreational side. I like to say it's like advertising in 1992." Digital and social media outlets make it difficult for cannabis companies to advertise despite legalization in more than half of the country. Google won't allow "ads for substances that alter mental state for the purpose of recreation or otherwise induce 'highs,'" listing marijuana next to cocaine, crystal meth, and illegal opioids. Meanwhile, Facebook continues to restrict ads promoting "the sale or use of illegal, prescription, or recreational drugs" while also apparently shadow-banning pages with "cannabis" or "marijuana" in the name. Now, when users search on Facebook for even government agencies like California's Bureau of Cannabis Control, the platform yields no results. Smoakland is like other companies in the legal cannabis space that have taken to using billboards to get their message across. By law, cannabis businesses can advertise on billboards as long as they adhere to rules that include not using any depictions of minors or offering products for free or discount. But the regulations also require businesses to prove that at least 71.6 percent of the audience viewing the billboard is "reasonably expected to be 21 years of age or older," automatically limiting the amount of available ad space. "There's a shortage of billboards in the state now," said Yi. "The occupancy rate is at a historic high because the cannabis companies bum-rushed billboards." But where an outsider looking in might view these as obstacles, Smoakland sees opportunity. "You have to find a way to advertise yourself and activate your brand experientially," Yi said, "and if we can't do that online through Facebook and social media as an experiential play, then we have to subvert the rules and go right up against them." According to Yi, Smoakland is a private company funded by a small group of investors. Irfan Jaffery, who's behind the Camber restaurants in Oakland, is the owner and CEO. In addition to using its media leg to create and host its own content, Smoakland will serve as a platform and a creative agency for other cannabis businesses also trying to reach an adult audience. "We're trying to create a platform and apps for Roku, iOS, and Amazon Prime that offer a destination for cannabis-focused media and, therefore, cannabis-focused advertisers," Yi said. But none of this works without educating the consumer, and not just about the brand. August 14 marked Smoakland's first in a series of three workshops centered on CBD education held at Camber Montclair. The next one will be on CBD and pain management on Sept. 22, from 2-4 p.m., and the last will be CBD and seniors on October 20, from 2-4 p.m. Smoakland will also be participating in the Dimond district's Oaktoberfest by hosting its own adults-only cannabis area called Smoaktoberfest — all of this as the company refines its operations, builds its own ecommerce software, awaits the next phase of Oakland's equity program, and stays on top of California's ever-changing regulations. But that just gives it more time to connect with consumers. "We understand that we're not at the point where we can advertise product because of our licensing," Yi said. "Additionally, I don't think the market is there yet. First of all, we need to introduce ourselves. Secondly, we need to do a teaser, build interest, do press releases, do a media push, and that's what the panels and workshops are really about." Editor's note: A prior version of this story misspelled Oaktoberfest. This version has been corrected.